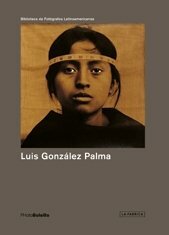 The rich sepia tone of a photograph by Luis González Palma (born 1957) is unmistakable: he colors his prints by hand but always leaves the whites of his portrait subject’s eyes untinted to elicit a disconcerting but penetrating gaze. Working from Guatemala City since the 1980s, and exhibiting internationally since about 1989, Palma has made his long-term project the documentation of his country’s indigenous Mayan population, which governmental policy has ferociously repressed during the last half-century. Often collaged with symbols and objects, Palma’s pictures act as records of a population for whom violence and mysticism coexist. Colloquia, a more recent project, gathers portraits of Guatemalan artists as part of a larger effort to establish a museum for contemporary Guatemalan art. PHotoBolsillo’s introduction to Palma’s work surveys over two decades of his highly romantic and politically urgent photography.